A renowned scientist is kidnapped by a mysterious group led by an enigmatic businessman. An internationally renowned scientist is escorted at gunpoint by a group of masked men to an obscure compound somewhere in South America. She demands to know who her abductors are and what has happened to her colleagues. Based on these first few minutes of Salt and Fire, you may think you’re watching an episode of a political action/thriller TV show, the slightly ridiculous kind that grace the American airways. But, once the political thriller facade yields to bizarre, nearly conspiracy-theory-level philosophising, it starts to make sense that the movie you’re watching was written and directed by the legendary Werner Herzog. 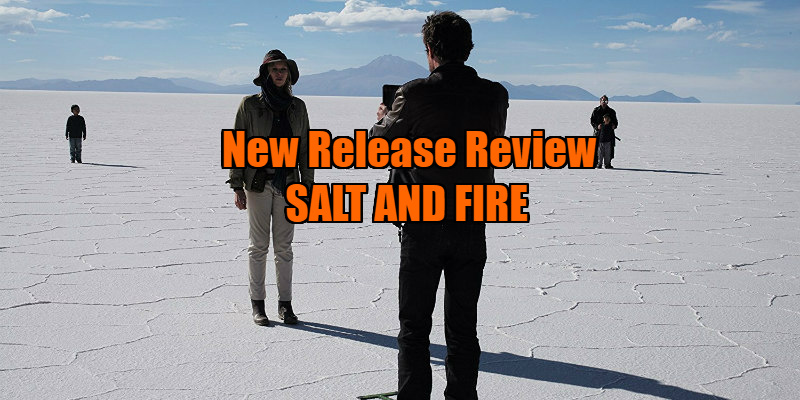 Salt and Fire is a strange little movie that seems hastily and carelessly slapped together by its idiosyncratic creator, even if certain moments glitter with true Herzogian brilliance. For much of the first half of Salt and Fire, something feels off-kilter. After a couple of scenes, it becomes clear that the problem lies in the dialogue, in both the lines themselves and the ways in which they are staged and delivered. In an early airport scene, the three professors notice a strange group of men observing them. Instead of exchanging hushed whispers of concern, the three indiscreetly and loudly gawk directly at the mysterious men. The first half of the film is bedeviled by many such roughly assembled moments. One wonders if some of these problems of delivery don’t stem from the fact that most of the cast members (along with the director himself) don’t speak English with native fluency. Ferres and Bernal seem to be straining to communicate their characters (unlike Michalowski, who seems significantly more natural). They’re not bad actors; Bernal, after all, has been very effective in roles as disparate as the one he played in Y Tu Mama Tambien (2001) to the one he played in Neruda (2016). But here, something is off about his inflection. Still, Lawrence Krauss and Michael Shannon are only marginally more successful. Shannon, an actor already predisposed towards bouts of hamminess, seems uncertain as to how to play a character driven by incomprehensible motives that are passed off as perfectly justifiable. Sometimes his over-the-top style suits Herzog’s over-the-top words, but other times it feels unnatural. Krauss is serviceable, but his sometimes-wheelchair-bound-sometimes-not character is so bizarrely drawn that it must have been difficult to play with any degree of credibility. Some of the unusual awkwardness of the dialogue and story could very well be intentional; after all, Herzog is not without a sense of humour. In the past 10 years or so, Herzog has made humorous, self-deprecating appearances on shows like The Simpsons, American Dad! and Parks and Recreation, so it’s clear he knows how to be funny as well as austere. But the jokes often land perplexingly. Bernal’s Dr. Cavani is played mostly for laughs, but his lechery (Salt and Fire is rife with troubling gender politics) is deeply uncomfortable. When Michalowski’s Dr. Meyer bitterly exclaims that he is having “the mother of all diarrhea” after eating bad food, the line sounds like it’s clamouring for a laugh, but it’s so outrageously out-of-keeping with the tone of the film (without being a particularly funny joke to begin with) that it—and jokes like it—land with a thud whose echo still reverberates in the mind once the film has ended. You can tell that a lot of things fascinate Herzog, but Salt and Fire is further proof that the legendary German director has trouble getting his ideas to coalesce. In Cave of Forgotten Dreams (2011), the cave paintings were fascinating just as the albino alligators of the film’s epilogue were fascinating, but no matter how much Herzog contorted his philosophical line of thought to find some mysterious ideological connection between the two images, it just didn’t hang together. The same goes for Salt and Fire. Riley’s interest in forced perspective art has very little to do with his interest in native South-American culture, yet somehow these concepts are presented to us as related. In many ways, Riley serves the narrator function that Herzog himself serves in his documentaries, a function that hops distractedly from idea to idea without elaborating or building on a sufficiently specific theme. One could argue that he’s striving for an Eastern-Philosophy kind of all-inclusivity—but one would only need to watch a film by Apichatpong Weerasethakul to understand that Herzog is engaging in what amounts to stoned-midnight-dorm-room-conversations about the nature of the universe. In Salt and Fire, Riley talks like he’s hopping from one Wikipedia article to the next; it’s not uninteresting, but it’s also neither cohesive nor revealing. Nevertheless, the maker of such stunning works as Aguirre, the Wrath of God (1972), Fitzcarraldo (1982), and Nosferatu (1979) still has some strikingly effective ideas on display in Salt and Fire. Some of the film’s strongest moments occur after Laura has been abandoned on the salt flats she is researching with two mysterious twin boys with eye deficiencies who are left in her charge. As Laura cares for these boys and forges means of communicating with them, Herzog seems to be returning to the man vs. nature kind of narrative that has historically given his films a fascinating intensity (Laura’s colleagues are abandoned altogether by this point). Here, Herzog manages to make that narrative surprisingly tender. One wishes that the inelegant dialogue, the half-assed philosophising, and the undercooked political intrigue of Salt and Fire could melt away, leaving us with those moments in which Herzog sticks to what he does best while also colouring what he does best in a new light. Salt and Fire tantalisingly does this in its second half, but unfortunately it’s too little, too late. 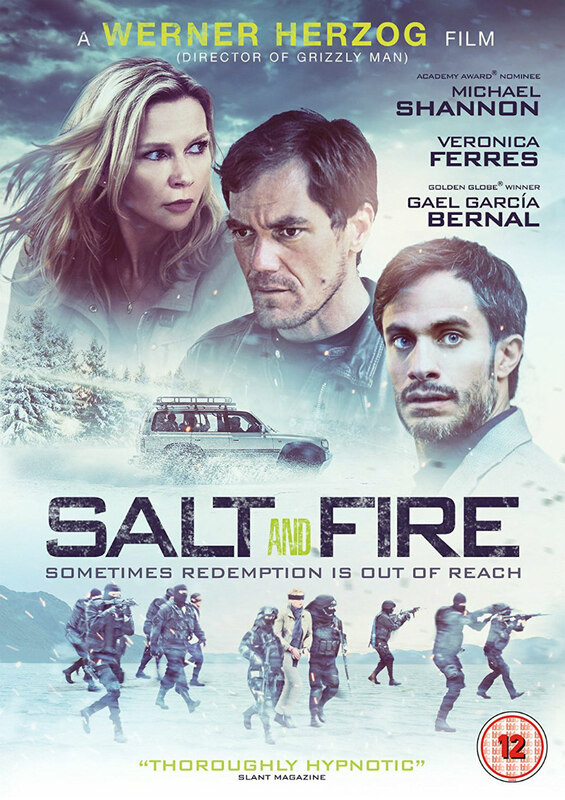 Salt and Fire is available on DVD and digital now.